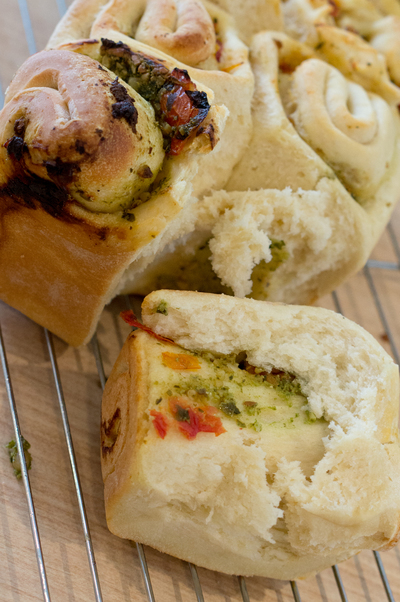 There is nothing better than the smell of bread baking in the oven and especially when it's filled with pesto, parmesan and sundried tomatoes. 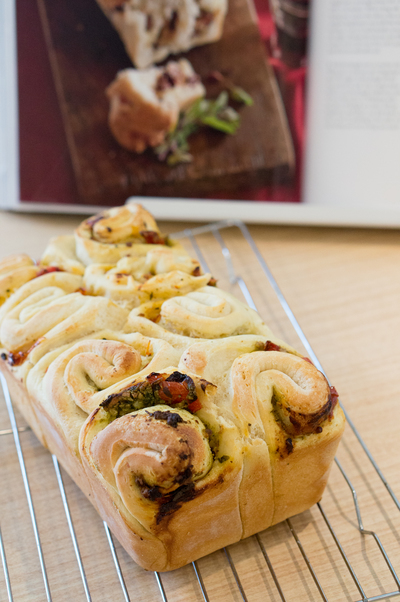 This pull-apart loaf looks beautiful and is so delicious. The bread is light and fluffy and the filling is a great match. Serve with some melted butter and you're in bread heaven. This loaf does require a lot of resting time, so make sure you have a few hours free! Combine 125ml (1/2 cup) of the water and sugar in a large bowl. Sprinkle over the yeast and set aside until foamy (about 7 minutes). Add the butter, milk, remaining water and half of the flour and the salt to yeast mixture and stir to combine. Add remaining flour, 1 cup at a time, stirring until a coarse dough forms. Turn out on to lightly floured surface and knead for a good 8-10 minutes until dough is smooth, elastic and soft. Place dough in lightly oiled bowl and turn to coat. Cover with glad wrap and place in a warm, drought-free place to rise for 90 minutes (dough should double in size). Knock back the dough with one punch and turn out on to lightly floured surface. Using a rolling pin, roll out the dough in to a large rectangle (about 26 x 40cm). 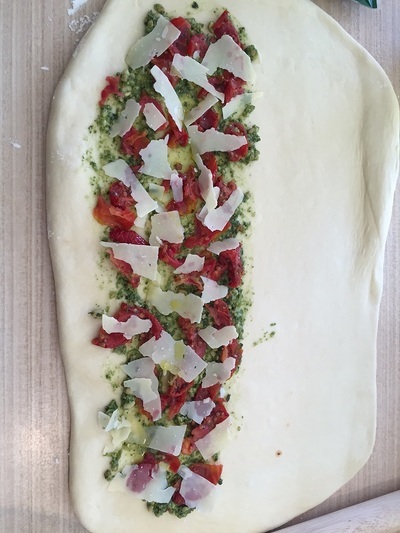 With the long side facing you, spread the pesto, sundried tomatoes and parmesan lengthways over half of the dough leaving a 1cm border. Drizzle oil over the filling and grease loaf tin with oil. Fold the dough over the filling and press down edges to the dough to seal. Use a large, sharp knife to cut dough in to ten portions. 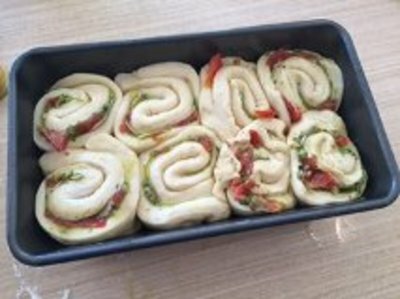 Roll each portion up lengthways and squeeze in to loaf tin. Continue packing all pieces so they fit snuggly in the tin and use hands to press down on the loaf to keep it the same size. Cover with a tea-towel and leave to rise for another 50 minutes (until dough rises to top of tin).